Joe Cool knows just how to dress for a night on the town! From Charlie Brown, to Snoopy, to the whole Peanuts gang, Persona has a variety of european-style charms and beads to customize your own gorgeous piece of jewelry. Persona sent me this darling charm bracelet with two of their delightful Peanuts charm beads. 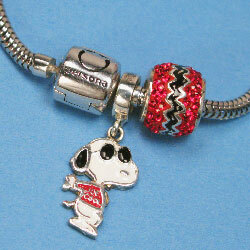 The bracelet features a Snoopy Joe Cool charm and a Charlie Brown zig-zag bead. 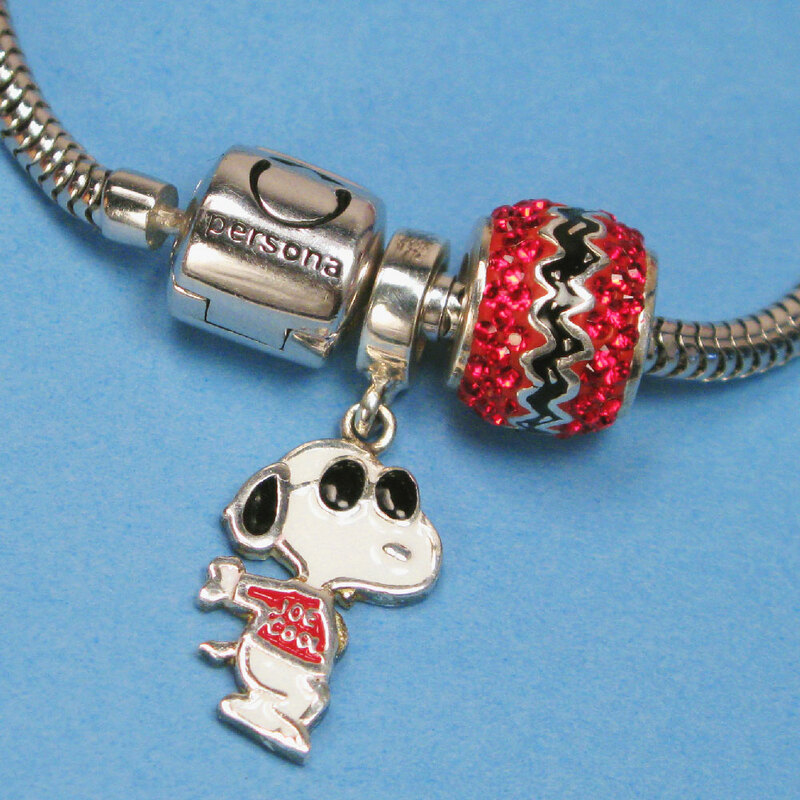 Joe Cool is a sterling silver dangling charm with hand-painted enamel accents to make Snoopy come to life. Made with Austrian crystals, the red zig-zag is a fun take on Charlie brown’s classic shirt. The Zig-Zag bead also comes in yellow and light blue. The bracelet is nice and light, while still feeling very solid and strong. The sterling silver bracelet shown here has a smooth rhodium plated snake chain with a barrel lock closure. It has a magnetic closure to ensure the beads stay safe. What first caught my eye about Persona jewelry was the quality of the charms. They capture the spirit of the characters with sterling silver, Austrian crystals, hand-painted enamel details and 18k gold. The beads are available in a variety of designs including Charlie Brown hugging Snoopy, Snoopy holding a crystal heart, Snoopy on his doghouse, even a “Good Grief” speech bubble. To celebrate “The Peanuts Movie”, they even have a Snoopy Flying Ace with the Eiffel tower! The holiday season brings an extra special collection of beads for Christmas. Charlie Brown’s tree, Snoopy & Woodstock in a stocking, Snoopy and a gingerbread doghouse, and Snoopy with a present are just a few of the charms to make the season sparkle! What I love about this collection are the great possibilities for gifting! Peanuts fans can be difficult to buy for, but this collection makes it easy to give a memorable gift that can be added to for years to come. Plus, I love the endless options for personalization. Beads can be changed out to suit an outfit, mood or season, yet still incorporate our favorite Peanuts characters! Bracelets are available in a variety of styles in both leather and sterling silver. Persona also has necklaces and earrings to customize, too. 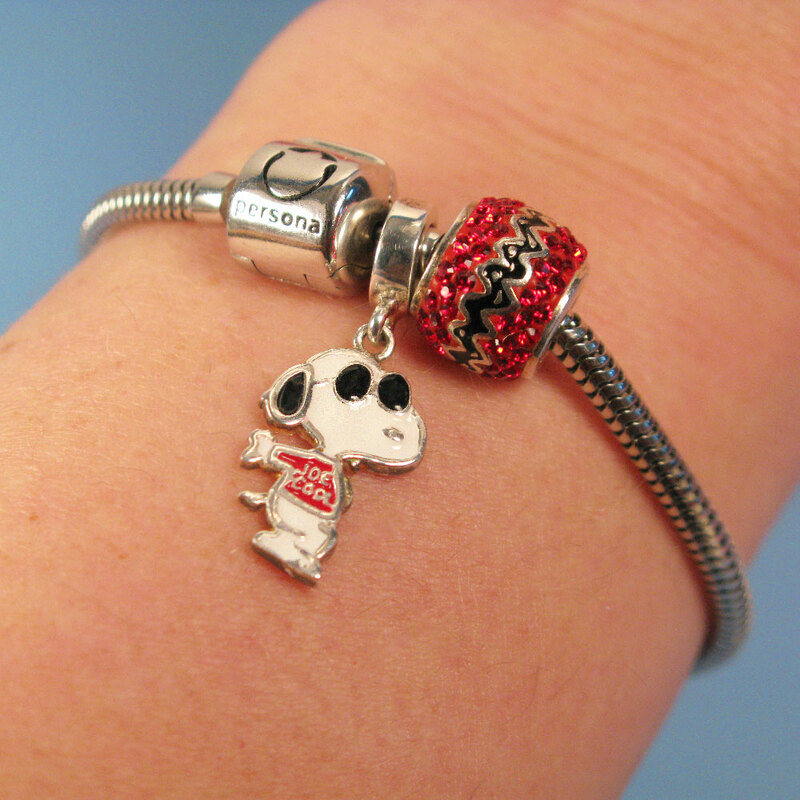 Make your jewelry truly personal by pairing Snoopy with your college colors, birthstone, initials, and other beads that tell the story of who you are. As well as sterling silver, crystals and gold, Persona also makes beads out of Italian glass, gemstones, marcasite, pearls and more. You can even add on to your current charm bracelet! Persona beads and charms are compatible with Pandora, Chamilia, Trollbeads and more. Disclaimer: Persona provided the sample for free. The review was my own opinion of the items. If you have any questions about the product or reviews, please let me, Caren, know at info@collectpeanuts.com.